Sony has announced the world's smallest 30x superzoom camera, Cyber-shot DSC-HX50V. The new camera sports a 20.4MP Exmor R CMOS sensor, a 24-720mm F/3.5 - 6.3 lens, ISO range of 80-12,800, built-in Wi-Fi and GPS, 1080/60p video recording function, continuous shooting mode at 10 frames per second, a dedicated dial for adjusting exposure compensation, a Multi-Interface Shoe for attaching an optional flash, microphone, and electronic viewfinder. The HX50 will be available at the end of May at $449.99. 4. DLC-HEU15 Micro to HDMI cable. 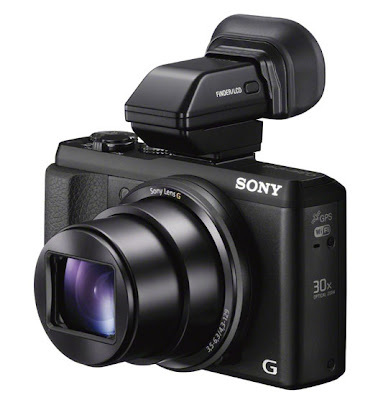 SAN DIEGO, Apr 23, 2013 – Today, Sony introduced the Cyber-shot™ HX50 camera – a powerful new compact featuring an impressive 30x optical zoom range and advanced 20.4 MP “Exmor R” CMOS image sensor. Measuring approximately 4.4”x2.6”x1.2”1 in size and weighing in at approximately 9.6 oz. 2, it is the world’s smallest and lightest camera with 30x optical zoom capability3. To complement the extensive zoom, the new Cyber-shot HX50V model offers enhanced Optical SteadyShot ™ image stabilization to reduce camera shake and blur at all ranges. At full zoom extension (30x) the HX50V camera offers stabilization that is approximately twice as effective as the HX200V high-zoom model introduced last year4. The high-resolution 20.4 megapixel sensor in the new camera is paired with a powerful BIONZ processor, allowing the HX50V camera to produce high-resolution, high-quality images in all types of lighting conditions – from broad daylight to dimly lit interiors and everything in between. Additionally, the HX50V model features exceptionally high-speed AutoFocus that can lock onto subjects at full zoom approximately twice as fast compared to the HX200V model5. The camera also features a powerful X-type lithium ion battery that is smaller than any of its predecessor batteries (in Sony Cyber-shot HX series) yet delivers an impressive 400 photos from a single charge6.